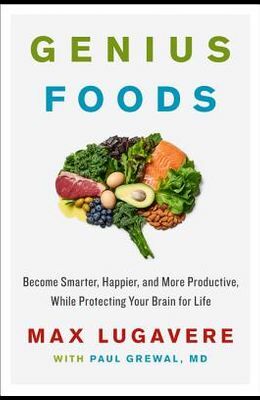 New York Times Bestseller Discover the critical link between your brain and the food you eat and change the way your brain ages, in this cutting-edge, practical guide to eliminating brain fog, optimizing brain health, and achieving peak mental performance from media personality and leading voice in health Max Lugavere. After his mother was diagnosed with a mysterious form of dementia, Max Lugavere put his successful media career on hold to learn everything he could about brain health and performance. For the better half of a decade, he consumed the most up-to-date scientific research, talked to dozens of leading scientists and clinicians around the world, and visited the country's best neurology departments--all in the hopes of understanding his mother's condition. Now, in Genius Foods , Lugavere presents a comprehensive guide to brain optimization. He uncovers the stunning link between our dietary and lifestyle choices and our brain functions, revealing how the foods you eat directly affect your ability to focus, learn, remember, create, analyze new ideas, and maintain a balanced mood. Weaving together pioneering research on dementia prevention, cognitive optimization, and nutritional psychiatry, Lugavere distills groundbreaking science into actionable lifestyle changes. He shares invaluable insights into how to improve your brain power, including the nutrients that can boost your memory and improve mental clarity (and where to find them); the foods and tactics that can energize and rejuvenate your brain, no matter your age; a brain-boosting fat-loss method so powerful it has been called biochemical liposuction; and the foods that can improve your happiness, both now and for the long term. With Genius Foods , Lugavere offers a cutting-edge yet practical road map to eliminating brain fog and optimizing the brain's health and performance today--and decades into the future. From the Back Cover A POWERFUL NEW GUIDE TO ACHIEVING OPTIMAL BRAIN PERFORMANCE THROUGH FOOD, FROM A LEADING VOICE IN HEALTH After his mother was diagnosed with a mysterious form of dementia, Max Lugavere put his successful media career on hold to learn everything he could about brain health and performance. For the better half of a decade, he consumed the most up-to-date scientific research, talked to dozens of leading scientists and clinicians around the world, and visited the country's best neurology departments--all in the hopes of understanding his mother's condition. Now, in Genius Foods , Lugavere presents a comprehensive guide to brain optimization. He uncovers the stunning link between our dietary and lifestyle choices and our brain function, revealing how the foods you eat directly affect your ability to focus, learn, remember, create, analyze new ideas, and maintain a balanced mood. Weaving together pioneering research on dementia prevention, cognitive optimization, and nutritional psychiatry, Lugavere distills groundbreaking science into actionable lifestyle changes. He shares invaluable insights into how to improve your brain power, including: The nutrients that can boost your memory and improve mental clarity (and where to find them) The foods and tactics that can energize and rejuvenate your brain, no matter your age A brain-boosting fat-loss method so powerful it has been called biochemical liposuction The foods that can improve your happiness, both now and for the long term. With Genius Foods , Lugavere offers a cutting-edge yet practical road map to eliminating brain fog and optimizing the brain's health and performance today--and decades into the future.